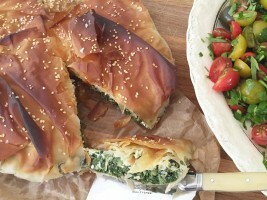 Spanakopita is the correct name for this Greek pie made of filo*, spinach, feta and egg. However my boys have named it ‘green pie’ rather than Greek pie since they are a) very literal, and b) not the best listeners. Regardless of the name, they and I agree (for once) that it is the most delicious way to eat a load of greens without fuss. Numerous children of my acquaintance have gobbled this down much to the amazement of their parents. But let’s not just save this for children. It is a perfect make ahead lunch, dinner, party or picnic food for all of us. *American friends – if you’re wondering what filo pastry is, it is phyllo or fillo dough in your neck of the woods. I first encountered Spanakopita when I was backpacking around the Greek islands with my lovely friend Megan when we were scarily young and footloose. I say backpacking, but although we set off with said backpacks and had our Lonely Planet island hopping route planned, we decided we liked the first island we stopped at so much we stayed there for the whole 2 weeks. We still reminisce about how simple life was then when we could laze for two weeks with no plan, no phones and barely any money. 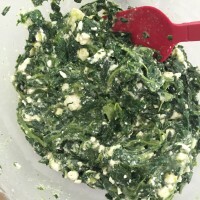 By the end of the two weeks we were running low on funds, so bought and fell in love with the fat wedges of wafer thin pastry filled with spinach and feta that were sold all over the place. Since those carefree days I’ve had a go at making all sorts of versions of Spanakopita. 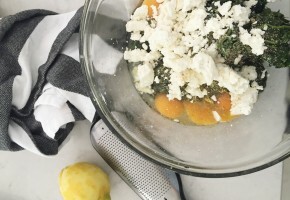 I only really made it regularly once my boys started loving it, as anything that helps them gobble greens and hangs around well for a few days in the fridge is a huge help for dinners and portable lunches. 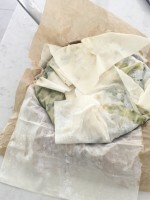 Traditionally Spanakopita is made in a big rectangle to be cut into slices, or as triangle samosa-like individual pies. I find that the easiest way to make it at home is to make little individual pies in muffin pans or a bigger pie in my frying pan and then cut it into fat wedges. My boys love making it with me and it is so low stress to make that I always let them help. I love using organic frozen leaf spinach in this recipe and in lots of other recipes. To get the volume of spinach I’d need from fresh spinach I’d need to buy a vast quantity and then spend time wilting it. The frozen stuff is already wilted and just needs defrosting and draining. I use fresh vegetables all the time of course but have no guilt about using frozen when they are cheaper, easier and as delicious as they are in this case. Frozen vegetables retain all their vitamins whereas fresh vegetables may have been sitting in a supermarket fridge for days before you eat them. I also throw the pellets of frozen leaf spinach into soups, stews and curries and let the heat of the food defrost the spinach. They’re handy for small servings of vegetables for children and are great in smoothies too. I always like to serve mine with a parsley, tomato and red wine vinegar salad. I just half some baby tomatoes, toss them with sea salt flakes, black pepper, lots of roughly chopped flat leaf or Italian parsley and red wine vinegar. The sharpness of the vinegar and the sweetness of the tomatoes works really well with the salty feta and green flavour of the pie. Around half of a 270g (around 9 oz) box of filo* pastry – you’ll usually find this wafer thin pastry in the chiller or freezer at the supermarket or a Middle Eastern store. You can freeze the half you don’t use for another day. 200-300g (7-10 oz) Feta. As always the best you can afford, but I’ve even made this with low fat Feta that I bought by mistake and it was fine. 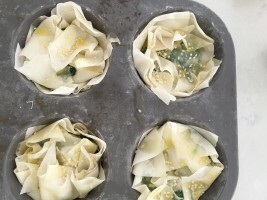 Optional – a tablespoon sesame seeds to scatter over the finished pie before baking, 3 finely chopped spring onions (scallions) to add to the filling. Put your frozen spinach in a colander and sit the colander in a large mixing bowl. Leave to defrost for a few hours then use a spatula to squish the spinach so that the juice goes through the colander into the bowl. You’ll be amazed how much water comes out and you’ll need to empty the bowl a couple of times probably. Once the spinach is dry you’re ready to go. In a rush? If you don’t have time to do this ahead of time you can defrost the spinach in the microwave and then push the liquid out in the same way as the above method. Put the drained spinach into a large bowl (I use the emptied bowl that I collected the liquid in below the colander to save washing). Add the eggs, roughly crumbled feta, lemon zest (I use my Microplane), nutmeg (I use my Microplane), oregano, salt and freshly ground black pepper and sliced spring onion if I’m adding it. Use a spatula to stir everything together well. This is an easy job for children to help with – my 6 year of cracks the eggs, my 4 year old crumbles the cheese then they take it in turns fighting over who mixes it while I tidy up a bit. Take a piece of baking parchment, around A4 size and crumple it into a ball. Then flatten it out and rub a little oil on it. Crumpling it makes it easier to fit into the cooking pan. Take 4 sheets of filo. Lay two of them next to each other, portrait, like two pages of a magazine, with the long side of each overlapping by about a half inch. Sprinkle or spray with a little olive oil and sea salt then lay the other two pieces on top, but this time laying landscape. Doing this reinforces the joins in the pastry. Sprinkle or spray oil and sea salt all over the top of the pastry which should now be in two layers. 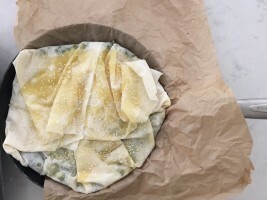 Then lift the parchment into a pie dish or ovenproof 20cm (8 inch) frying pan so that the parchment is sitting on the inside base of the pan and the pastry is sitting on the parchment with the pan in the middle of it. The pastry should be hanging quite a long way beyond the edges of the pan. Tip the spinach mixture onto the pastry, where the bowl of the pan is. Then use a spatula to gently push the spinach down so that it fills the base of the pan. Then take each corner of the overhanging pastry and roughly fold it over the top of the spinach. Tuck it all in so it looks like a messy bed, or a pile of fabric. Spray or rub the top with a little oil and then sprinkle with sea salt flakes and sesame seeds and transfer to the oven to bake for 40-45 minutes. Take 4 sheets of filo. Lay them on top of each other then use scissors to cut them in half lengthways and then into squares. Spray or sprinkle the base of a 12 hole muffin pan with a little olive oil. 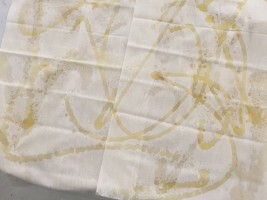 Then lay 3 squares of the pastry into each hole, spraying or dabbing a little oil between each layer and gently pushing them into shape with your fingers. I like to lay each square at an angle so that the corners of the pastry look like a flower rather than all being lined up. Sprinkle or spray oil and sea salt all over the top of the pastry which should now be in three layers. Spoon equal amounts of the spinach mixture into each hole. Then use a spatula to gently push the spinach down so that it fills the base of each hole. Then take each corner of the overhanging pastry and roughly fold it over the top of the spinach. Tuck it all in so it looks like a messy bed, or a pile of fabric. Spray or rub the top with a little oil and then sprinkle with sea salt flakes and sesame seeds and transfer to the oven to bake for 30-40 minutes. 7. Cook the pies until the tops are dark golden and the base is pale but more golden than when you started. The bottom of the pie won’t be as crisp as the top but it will still be cooked. 8. Take the pan out of the oven and leave the pies to cool in the pan for about 10 minutes before gently taking them out to cool. I like to serve the pies at room temperature with a room temperature tomato salad rather than straight from the oven. Any leftovers can be wrapped in foil and kept in the fridge for 2-3 days. The pies are best popped in a hot oven for 5 minutes before eating if they’ve been in the fridge. 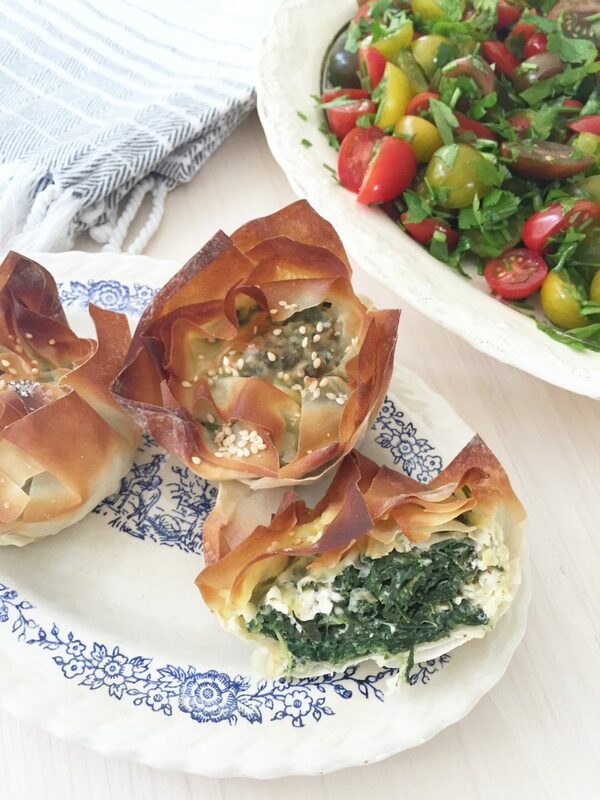 Find more recipes for spinach, pastry and picnics here.